Today, September 5th, marks the anniversary of the North American debut of my favorite Sony series — LocoRoco. Sony Japan’s colorful puzzle platformer is a delight, and I can’t imagine anyone playing it without grinning from one ear to the other. It’s the closest that the medium has gotten to digital nirvana, and it’s the game I immediately think of when someone asks me what the happiest video game is. Sony hasn’t released a new LocoRoco title since 2009, so I have had to get my fix elsewhere. Thankfully, there are other video games that are also a joy to play. Since I’ve gotten so much joy out of these PlayStation titles, I wanted to share with our readers what some of the happiest video games are. The only rule is that they’ve had to have appeared on a PlayStation console, since we are a PlayStation-centric site after all. Check out my list of 10 of the happiest video games below! I hope you enjoyed my list of 10 of the happiest video games. It was tough narrowing down the list to only 10 titles, so a lot of joyful games didn’t make it through cuts. 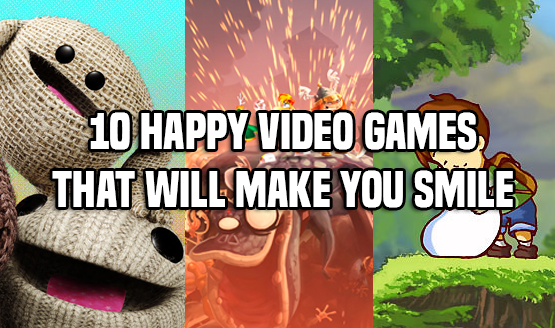 That’s why I want to hear about what video games make you the happiest. Let me know in the comments below what the happiest video games are for you, and if you think it’s time for a new LocoRoco game!